The 1980 United States presidential election in Missouri took place on November 4, 1980. All 50 states and The District of Columbia were part of the 1980 United States presidential election. Missouri voters chose 12 electors to the Electoral College, who voted for president and vice president. 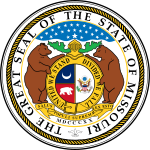 Since 1904, Missouri has voted for the eventual winner of the election in a presidential election, with the exceptions of the 1956, 2008, and 2012 elections. This Missouri elections-related article is a stub. You can help Wikipedia by expanding it. This page was last edited on 1 February 2019, at 00:32 (UTC).